These secretly Healthy Nutella Chip Oatmeal Cookies are sweet, chewy, addicting, and PACKED FULL of chocolatey-hazelnutty goodness. You’ll be in utter shock when you taste these because they don’t taste healthy — not in the slightest. Awwww yissss! 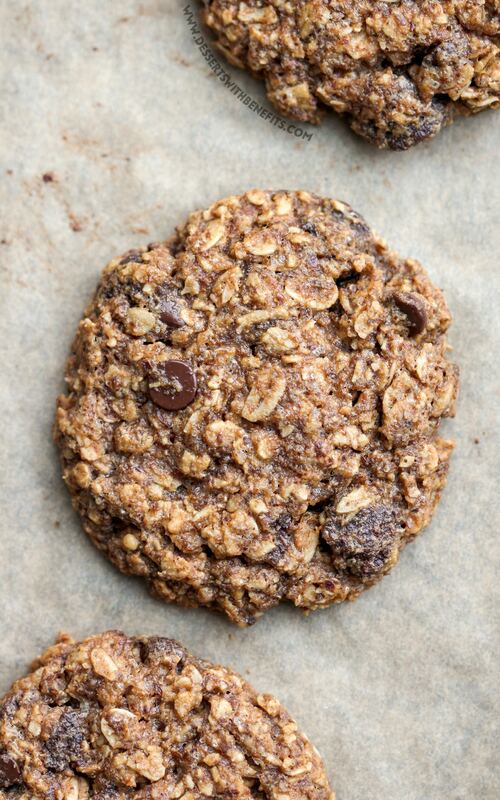 These Nutella Chip Oatmeal Cookies are refined sugar free, gluten free, dairy free, and vegan. It’s literally magic in the form of a cookie. 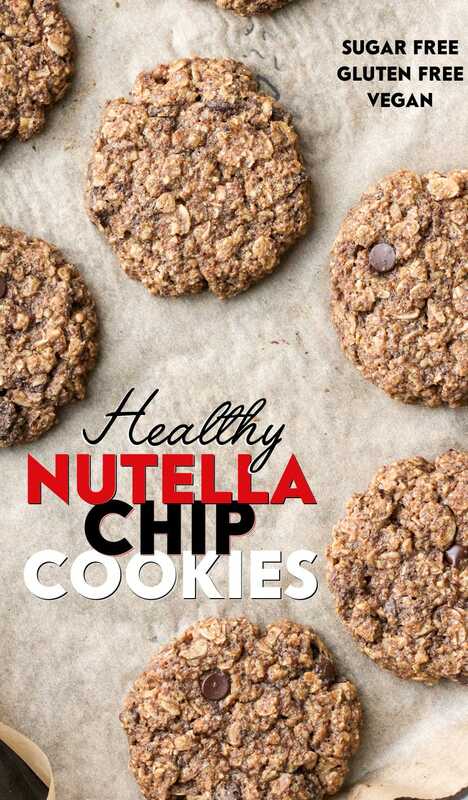 Remember those Healthy Nutella Baking Chips from Tuesday? Well, those aren’t just for snacking, they can be used in baked goods too. And, obviously, they make amaaaazing cookies. After making four batches of my Chewy Peanut Butter Oatmeal Cookies (IN A SINGLE WEEK, might I add), I was on a cookie roll. Cookies are addicting. Once I had a taste of the good life I wanted more and more and more. Since those Nutella Baking Chips were screaming my name, I decided to swap out the “peanut butter” for “chocolate-hazelnut” flavor. It took a few batches to get these cookies right. All of the batches tasted amazing, but it came down to the texture. The first batch hardened into rocks the day after baking. The second batch didn’t spread out as much as I’d hoped. The third batch seemed to dry out the next day. And finally, the fourth batch came along. Each cookie, no, each BITE, has got a punch of flavor. You get the hazelnuttiness, you get the chocolate, and you get the sweetness, all in a soft and chewy, yet hearty, oat-filled cookie. So yeah, slide those Oatmeal Raisin Cookies to the side and make these Nutella Chip Oatmeal Cookies instead. These bad boys are showstoppers. These are pure comfort in a healthy package. It’s love in cookie form. These Nutella Chip Oatmeal Cookies make everything right in the world. In a stand mixer bowl fitted with a beater attachment, add the almond milk, hazelnut butter, melted coconut oil, flax, molasses, vanilla extract, and butter flavor. Mix on low speed until completely mixed through. Turn off the mixer while you prepare the dry ingredients. In a large bowl, stir together the oats, erythritol, oat flour, baking powder, baking soda, and salt. Dump the dry ingredients into the stand mixer and mix until incorporated. Dump in the Nutella Baking Chips and chocolate chips and mix one last time. Scoop the dough onto the prepared cookie sheets (I used a black size 30 scooper/disher). Roll the dough into balls, then flatten into patty shapes. Bake for ~13-14 minutes. Let cool on a wire cooling rack, then serve and enjoy! Store the cookies in an airtight container at room temperature for up to 4 days. These Healthy Nutella Chip Oatmeal Cookies are best served nice and warm. They’re soft and chewy already, but when they’re warm, the chocolate gets all fudgy and melty, and it really brings out the flavor of the hazelnuts. Just pop a cookie in the microwave for a few seconds and BAM! You’ve got yourself a “freshly baked” cookie. 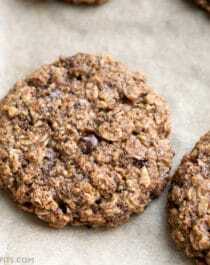 I will definitely be making these Healthy Nutella Chip Oatmeal Cookies again and again and again. They taste exactly like the cookies I used to buy at the grocery store — super sweet, buttery, and unhealthy… but they’re not! These cookies are refined sugar free, gluten free, and vegan. Just trust me, these taste like pure sin. It was my first time baking healthy just following your directions and ended up with my flax egg bowl sitting beside my already mixed wet and dry ingredient. I was sad T.T but luckily flax egg is not like real egg I don’t have to beat it or anything so I just add it in and it turned out well still! Those beauties look amazing and super healthy! Have you tried subbing almond or coconut flour for the brown rice flour? I think I’ll try making them tonight! Thanks for sharing! I’m sure almond flour will work, however the cookies might be a little crumbly. Almond flour doesn’t bind very well, so you might need to add an egg or a flax egg. Coconut flour won’t work because it absorbs too much liquid, and will result in a delicate crumbly cookie. I just found your blog and I want to try these great-sounding cookies. I love baking with alternate grains, just to mix up the flavors and textures to more wholesome ones. I do want to alert you and your readers though, that some things are not “healthy” in this recipe (and others?). It’s not worth our health to use foreign chemicals in our ingredients that we were never meant to ingest, just to save a few calories! I’d never heard of butter extract before, so I clicked over to that link. The ingredients contain propylene glycol. This ingredient is found in anti-freeze and cosmetics. It’s also in flaked coconut to keep it moist. Read your ingredient labels! I take it as a personal challenge to eat only things I recognize (and my stomach and liver will recognize) as real food. I urge you to do the same. For recipes with butter I usually cut the amount of butter I use in half and substitute apple sauce, non-hydrogenated coconut oil, olive oil, etc. for the other half (or less) depending on the end product being sweet or savory. The texture can be a little different sometimes, but I know the fats I’m ingesting are truly healthy and all the flavor will be there from real food. Cheers! So glad you found my blog too!! As for the butter extract, it is a very small amount used and while propylene glycol might be used in different applications, it doesn’t necessarily make it unhealthy. Xanthan gum is a natural thickener that is used in cosmetics as well, yet it is perfectly safe to ingest. Propylene glycol has also been deemed safe by the FDA for human consumption. I truly have no issue with butter because I am healthy and have good cholesterol levels (low LDL, high HDL), but I avoid it in my recipes because it can do some harm to other people out there. I only buy organic butter from from grass-fed cows (you don’t get that dangerous imbalance of too much omega-6 and too little omega-3). I’m not sure if it’s just the butter at the grocery stores near me, but butter nowadays often has “natural flavors” in it… which is basically butter extract to make the flavor more potent. I’m hoping that this is the recipe I made that my nephew in the Navy just requested for a care package for him and his buddies. I have a lot of similar chocolate chip oatmeal almond butter/meal recipes, but this one I gave 10 stars! Certainly looks worth a shot and hope to make him so happy again. Thanks for all you do, Jess! If I was going to swap out the butter flavor for real butter, do you know about how much butter to use?